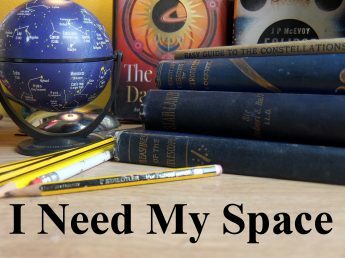 Bobbington Observations.. | I Need my Space! 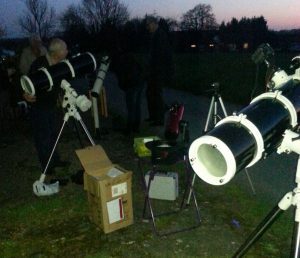 Ten society members attended, and six telescopes were lined up on the hard-standing, ranging from small table top Dobsonians to larger 8” reflectors on equatorial mounts. I’d brought the society’s 12” Tom Collier in my van, but had forgotten to bring the swivel base! (Luckily, I’d also brought my own 8” reflector. We’ll be sure to use the Tom Collier Dobsonian next time). The stars started appearing around half eight, and the constellation of Orion was spotted, very low on the western horizon. We took the opportunity to look at the Trapezium, below the belt of Orion, for possibly the last time this spring. The constellation was placed too low to detect the surrounding nebulosity of M42, but the large open clusters Hyades and Pleiades could still be seen as they headed towards the horizon, making room for the summer constellations of Bootes and Hercules, rising in the south, behind us. I took some single shot lunar photographs with my DSLR, (pictures 2 & 3) before moving on to Venus. The disc of the planet could be easily seen, and its gibbous disc around 90% lit could also be seen by keen eyes through the larger scopes. Venus will continue to ‘grow’ over the next few weeks and months, and will eventually display a much larger crescent as it moves towards us. (picture 4). The new observing site is on the grounds of a campsite, and people from the adjoining campsite were invited to join us. 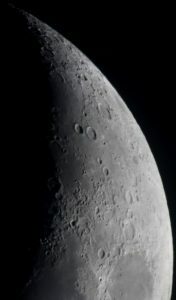 Many of them enjoyed views of the Moon and Venus, having never looked through a scope before. At times, there were crowds of upwards of twenty five people milling around the telescopes, asking questions about space and telescopes. Having visitors made a nice addition to the evening, it’s always fun to share astronomical views of the night sky. 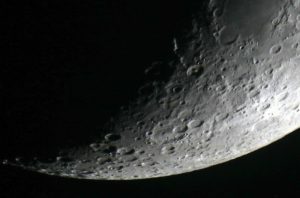 The campers particularly enjoyed views of the lunar craters Hercules and Atlas, which were dramatically well lit on the north-east part of the Moon, to the south-east of Mare Frigoris. 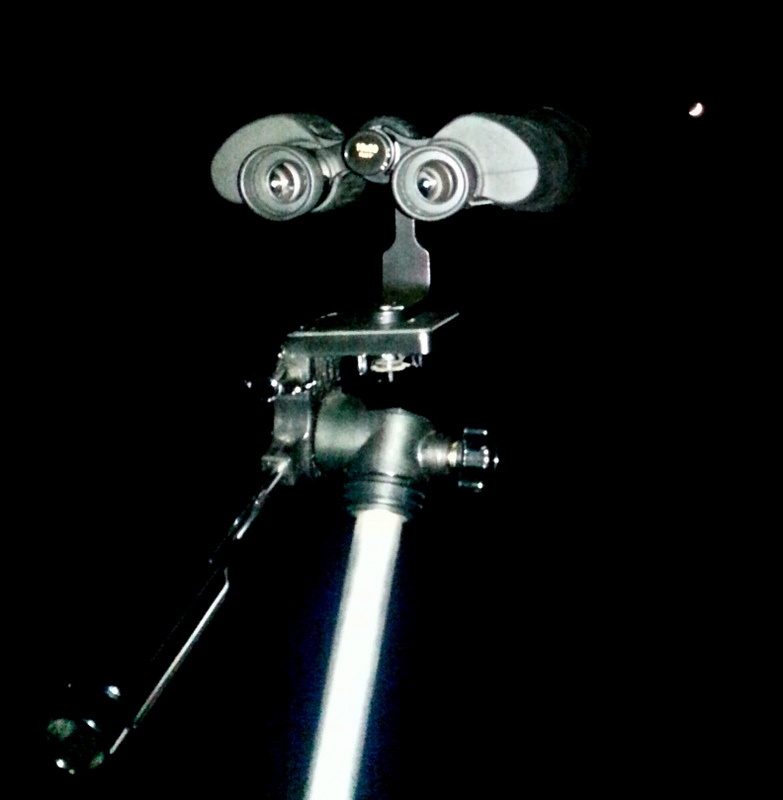 Martyn was hunting double stars with his pillar-mounted 110mm reflector. The constellation of Gemini was looming high above us in the south-west, and Castor made for a striking double in the eyepiece. Castor is at least a sextuple star system, about 45 light years away. The two golden binary stars we could see this evening have an orbit of 400 years. Bob used two Barlow lenses in conjunction on a Skywatcher 200p, to give a very ‘close’ image of a small lunar impact crater inside a larger one, a surprisingly sharp image, we all agreed. Meanwhile, Cath’s table-top Dobsonian was taking in some final views of the Pleiades as it headed towards the horizon. This cluster, (also known as the Seven Sisters and Messier 45), contains hot B-type stars located in the ‘winter’ constellation of Taurus. It’s one of the nearest star clusters to Earth. Although Cassiopeia and Perseus were at their lowest position on their circumpolar travels, they were well placed for observation from this site with such a low westerly-northern horizon. It was an excellent opportunity to explore the clusters in this area of sky. A pair of Opticrom 10X50 binoculars, mounted on a photographic tripod gave us lovely, steady, wide-field views of this area. (picture 5). The first port of call was Melotte 20 – the Alpha Persei ‘Moving’ Cluster, a lovely loose cluster in binoculars, which includes the 2nd magnitude white-yellow supergiant Mirfak (also known as Alpha Persei). Moving along from Melotte 20, we found the famous Double Cluster, NGC 869 and NGC 884 which lie at a distance of 7500 light years. Also spotted was the smaller, less visited nearby cluster of Stock 2. This isn’t marked on all star maps, but it’s well worth a view. Travel upwards and to the right of the double cluster, and there it is. Underneath the great ‘W’ of Cassiopeia, the Owl Cluster – NGC 457, (also called Caldwell 13) was also observed, very pretty and easily spotted against the now quite dark, spring night sky. I also found ‘Eddie’s Coaster’ – a recently named asterism in the style of The Coathanger in Vulpecula. Next stop was Stock 23, also known as Pazmino’s Cluster. A pretty, small loose open cluster above, and to the left, of Cassiopeia. This region of the sky is rich in star clusters and very favourable for wide-field observing, and the clusters make for excellent targets when the night-time moon is out, and nebulae and galaxies are lost in the brightness. The pillar-mounted 110mm reflector was still hunting double stars. Fine views of Cor Caroli in Canes Venatici, and Algieba in Leo. Cor Caroli is 130 light years away, and it takes 10,000 years for the secondary to orbit the primary. Algieba is 1000 light years away, with a 600 year orbit. With Leo high in the south, the moon’s brightness made hunting for Leo’s galaxies a tough task on this night, but in between Gemini and Leo, we enjoyed splendid views of the Beehive cluster, both via an 8” reflector, and the tripod-mounted 10X50s. With Capella shining brightly in the west, the bottom half of Auriga revealed its wonderful chain of star clusters, M36, M37 and M38, which were easily found in both telescopes and binoculars, above the ‘Leaping Minnow’ asterism. In the south-west, after 10pm, a bright ‘star’ appeared above the horizon. We’d been hoping for a sight of Jupiter this evening, and we weren’t disappointed. The completely cloudless sky allowed us to get a telescopic view of the great gas giant. Having a low aspect, and looking through so much haze, the planet’s cloud belts weren’t apparent, but four moons were. I made a quick sketch, and later added the moon names after consulting the Jupiter section in April’s Astronomy Now magazine. Second furthest away from the planet, the great moon Ganymede shone slightly brighter than the rest, easily viewable in the two telescopes that were re-located for a better viewing of the Jovian world. 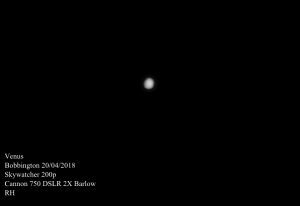 One member told me this was his first telescopic sighting of Jupiter, which was a very nice ‘first’ to add to the evening. Everyone agreed it was a very successful, enjoyable session. It was great to see the telescopes lined up in the viewing area, which was well out of sight of the main road (picture 6). Thanks to Wolvas member Steven Hare for accompanying me to the site to ask permission initially, the previous weekend, and special thanks must go to Rebecca for kindly letting us use the site. Thank you also to the campsite residents for making us feel so welcome. We’re very much looking forward to returning to Bobbington for more astronomical treats. If you’re interested in attending an observation session, please give a committee member your mobile number and you’ll be put on the ‘text notification system’, and will be informed of every upcoming session.